The Compound is infamous in Melbourne for drag racing, dirt biking, four wheeling, paint ball and more, it is a large area of paved streets, of about 200 miles of road. The streets were paved in the 1980s by General Development Corporation (GDC), intended for housing development, instead, the company went bankrupt in 1991, and it became a playground for those with dangerous hobbies. Also known as “the Grid” or “Palm Bay Maze” there are no street signs, and incredibly easy to get lost. Many, many injuries have occurred there, though its not sure how many deaths… however, its become an energy attracting hotspot, many people report seeing people walking along the streets and disappearing, as well as phantom lights along the streets. Back about 16 years ago myself and a few friends went out to the compound. A friend of mine was driving and he was going very fast. my best friend was in the passenger seat became scared and yelled slow down. The kid driving the car lost control. We began to slid off the road. the car went through grass taller than the car at a very high speed. I braced myself thinking at any moment we would hit something or the car would flip. We came to a sudden stop, there was no grass in front of us any longer. We got out of the car and the hood of the car was inches from a huge ditch. A ditch that if we would have went into would have flipped the car or wrecked it. It took all 4 of us to push the car back to the road. tires were popped the car was un drivable. We all 4 were in shock. We still to this day can not explain what suddenly stopped the car and how we did not end up in that ditch. later that day we went back and looked at in the day light the ditch was 3 times the length of the car we were in. there was no skid marks. what we were driving through was extremely high grass.Cant explain the sudden stop. The scary thing about this place is that it is such a huge area, if something were to happen to you or your car .You cant tell someone where to go to find you, there are no street signs and no landmarks. Everything looks the same. NO TO MENTION THERE IS ONLY ONE WAY IN AND OUT. We have one picture of a ghost girl at the compound. What other pictures u have and what street? Also a ghost dog. We ride at night. It is awesome! Most fun you can have! My daughter and I love to explore the compound, hiking and just enjoying nature. We’ve seen wild turkeys, bobcats, deer, Dung beetles, rabbits, skinks, snakes and much more…we’ve also seen a ghost and a ufo. While driving at dusk one night we saw a white, misty figure standing by a railing near the side of the road, which simply disappeared after a moment. The ufo was seen at night, flying unbelievably fast and zipping side to side at odd angles through the air as well as straight up and down. It was v-shaped, with red, green and yellow lights outlining it, and was fairly small. People fly rc planes and such out there but always during the day and those devices never move like this thing did. There was a vehicle out there, mirroring the movements of the ufo; several times we tried to approach the vehicle to ask their thoughts on it. It drive strangely fast and we saw the ufo land on the roof of this car, and then both took off faster than we could keep track of. Out there, at night there is basically pure darkness. We should have seen the lights of the car and\ or the ufo as they drove away. The speed though of the vehicle was amazing and they basically just disappeared without a trace. We were following right behind them at first and then they were just gone. We love it out there. Sure, I see pink elephants everyday too!!! General Development Corp. bought the Platt Family cattle ranch in the late 60’s. 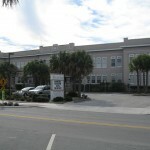 It encompassed almost all property West of Babcock St. and South of Palm Bay Rd. Currently the bulk of Palm Bay proper. As soon as the first road was paved, GDC flooded magazines and newspapers with ads for Florida retirement land, cheap, Of course, they financed it for you. Some lots on larger canals were advertised as “Waterfront” property. It’s possible to canoe to the Indian River on them. We started riding our dirt bikes along the canals as soon as they started digging them for drainage of the property. As housing areas developed, we had to keep moving further West and South to ride. Often there were nearly 100 dirt bikes on the trails on a Sunday, with many minor and a few fatal accidents (mostly on the paved road intersections). The police never bothered us until the early 80’s. Mostly because some riders didn’t have the courtesy to stay away from new homes. I have seen small airplanes land/take off on the roads, and I’m sure it was a drop point for some “bales”. I built a house close to the new post office in 1987 on a lot that was one of our favorite “pit” areas for the bike riders. Until today, I never heard it called “The Compound”, we just called it GDC. As for G.D.C. going bankrupt, the details are foggy, but there was a lot of press about it in the 80’s. About a dozen of the multi multi millionaire execs got caught in some scheme. Thanks for taking the time to record and post the video and listen to me ramble on. This place isn’t haunted. We go out there all the time. You wo t get lost if you have a GPS as all roads are mapped. My granddaughter Sheena Henry and her friend Kris Bass/Armstrong was killed August 27 @1:25 am 2016.their big crosses is all we have of them now.a truck hit their truck killing them.